Hi everyone I just had a couple questions. I've had my les paul for 5 year, and for a few years I noticed that it was very noisy. Recently it has become unbearable. The buzzing only goes away only when I touch the pickups, the toggle switch nut, and also the 1/4 inch jack nut but continues when I touch the strings or the bridge/tail peice. Also when I am playing, the guitar will often pop when I move. I am wondering if this could be caused by the ground wire improperly soldered to the bushing of the tail piece? 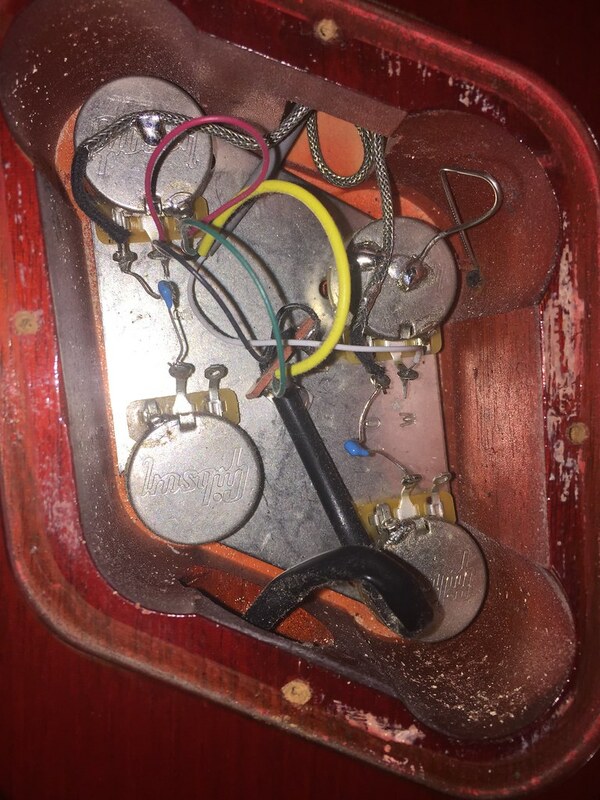 I will be taking the guitar into my local guitar tech to have all the stock electronics and 57 classics replaced with a good quality 50s wiring harness (CTS Pots, vintage Bumblebees, braided wiring) and some new wolfetone Dr. Vintage (I was already going to do this anyways)I will have my tech check the ground wire as well. Anything else I should have checked? I have heard some horror stories Gibson's QC and how some of the ground wires weren't even soldered. Also My other Les Paul is completely silent with the same setup (Cables, amps, pedals etc) and it doesn't pop when I play at the same venues. Sounds like there is a grounding issue at the pickup selector switch or output jack. I removed that screw on the ground wire and lightly tugged at it, it seems to be soldered well so it's probably not the issue. The additional screw is a mystery!! still doesn't surprise me at all? Before I changed out my original Trad wiring for 50s wiring, it looked liked the soldering had been done by a blind chimp! The pic above show how my tech fixed a similar problem to your issue. It is a cloth-covered ground wire soldered to all the pot backs and running to a small screw in the cavity. The screw runs into a strip of copper sticky tape and makes contact with shielding foil on the cavity plate back. It is reversible, if need be. I later added Orange Drop caps and it quieted the guitar even more. I hope this is of some help. Ask you tech if this would work in your guitar. He may choose another method as there is more than one way to fix this problem. The method you show is how I bought my wiring harness too thank you for the suggestion! Check the earth with a multimeter. One end of the back of your pots then one end on the tail piece. The easiest way to check if the earth is touching the bushing. I had a recent interference issue that wasn't caused by a bad ground. So I shielded all of the cavitys and routes with conductive paint, best decision ever. Initiative is sometimes not always a good thing? Before you spend any money or make changes to the guitar, I'd suggest trying someone else's amp at another place to rule out your amp / home electrical system. Also I know it's not just my house, I play at different venues and the popping at least doesn't go away, but the buzz may get softer depending on the quality of the electrical system. When your tech finishes with your guitar, please let us know what his opinion was with respect to the "buzz" and how he fixed it. I have a 2010 Studio Deluxe that despite having shielding work done, still emits more hum than I think should be normal. How well is it shielded? Now I've finished mine it really is quite even atgig volume. It's really important to check conductivity across all th ecavitys and writing routes. That screw connected to the cable is doing nothing. I would remove that screw and see what happens. Seeing how all of Your pots are on the plate, there is no reason to ground anything, and I don't see how a screw "grounding" it to Mahogany is going to do a darn thing. I would take that little cable out of the picture and see if that helps. It can't hurt. That wire connected to the black screw just looks like a piece of solder, not wire. I can't say that I've ever seen that trick before. I would try losing that little piece of "engineering". It also looks like the piece of white wire goes through the hole on the pot connection, and may be touching the plate. I don't think a connection on the pot that touches the grounded plate would do any good either. Until I get myself a multimeter, I cannot answer the question. The switch cavity was not shielded with any material, so there could be a problem there. Then too, the volume pots are the type for coil tapping; activated by pulling the knob up. I live with it by going no lower than +-8 on the volume controls!? I just don't see what it's grounding. 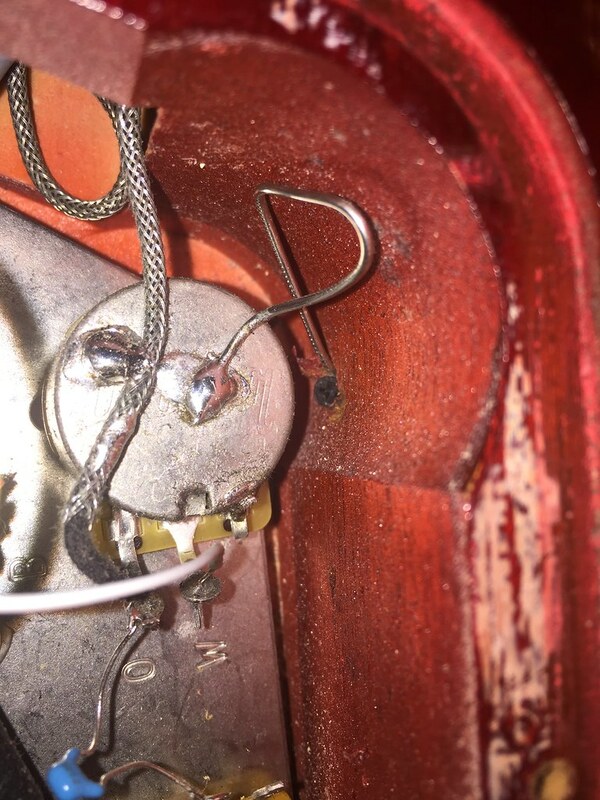 The pot that the solder and black screw are connected to is already grounded at the point where the pot is bolted to the plate, so I don't see any reason for the solder and screw to even be there. Nothing is ever going to ground anything if it just gets screwed to Mahogany. I would TRY taking the screw out, and hang the solder in mid-air so it doesn't contact anything. Then, pry the very tip of the White wire up and away from the base plate, and see how it sounds. You have nothing to lose, and nothing is going to blow up just by performing those two actions. It's worth a try!